If you're going to make bread (see last post), you need a good bowl. I find that ceramic/stoneware (although harder to initially heat if your house is cool) tend to hold warmth better than other materials. This will help the rise of your bread. As we all know, any help in that regard if appreciated. 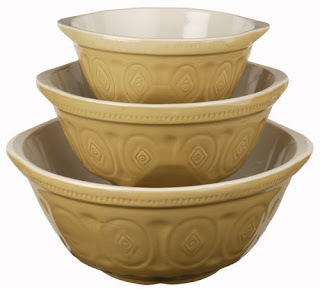 I have had a set of three ceramic bowls for years. The ones I purchased are not any of the ones listed below, but are identical to the photo at left. Except for the biggest one. I broke it, and had to replace it with a Mason Cash (image below). 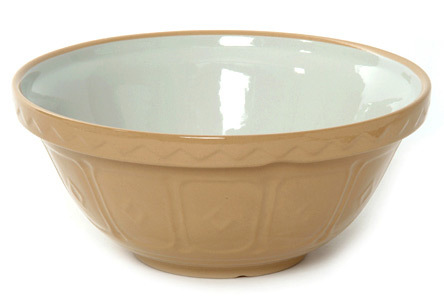 The traditional mixing bowl is a design classic remaining unchanged for over 100 years. Why would you when it works perfectly? Glazed stoneware is the ultimate material for them. The bowls have substance, so they don't slide about as you mix, are sturdy and retain warmth better than steel or glass. The bowls also fit snugly in the crook of your arm, just the way it was developed to do for bakers and chefs more than a century ago. They nest together for reduced storage space, and are safe for dishwasher, freezer, oven, and microwave, depending on the brand. Always check. Many farm houses throughout the Maritime Provinces have a set (or what remains of a set) of similar bowls lurking in the back of some cupboard. Everyone had them. They had to so they could cook and bake to live. Every gadget and utensil in times past had to be highly functional. If any were difficult to use or impractical, they were left by the wayside. Not so with these bowls. Regardless of the maker you purchase, you should look for is a flattened area on the exterior of the bowls (see above), so you can tip it on its side, yet remain supported. This is perfect for beating ingredients together that are of a stiff consistency – like dough. The undisputed "classic" bowls are made in the UK by Mason Cash. At first glance, the traditional English pattern around the outside of the bowl seems superfluous, with even a hint of kitsch. But an efficient mixing bowl needs to be heavy to counter the tendency to move during manual mixing. The pattern helps to make the bowl appear less heavy than it actually is, and its subtle relief enhances the bowl's timeless elegance. Mason Cash ceramic mixing bowls are made from 'white and cane' glazed earthenware sometimes known as 'yellow ware' from the colour of the local clay. The design has hardly changed for over a hundred years, although the modern version has leadless glazes that conform with Proposition 65. 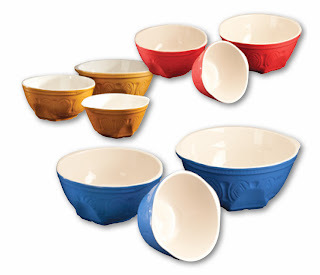 The mixing bowls can be used in the oven and microwave, and are safe in the freezer and dishwasher. The English pottery that eventually became Mason Cash originates in the early nineteenth century in Church Gresley, a village in Derbyshire. It was known for Meashamware, a distinctive brown pottery that probably acquired its name because it was popular in the nearby Leicestershire village of Measham. The name 'Mason' comes from a Master Potter, "Bossy" Mason who was running the pottery at the time it was acquired by Tom Cash in 1901. Cash renamed the company Mason Cash & Co. It was later incorporated by his son, in 1941, a period during which the firm diversified into bowls for cats and dogs – a product range for which Mason Cash became known around the world. So where does one acquire such a necessary item? I have seen these or very similar bowls at larger Home Hardware stores in Nova Scotia, as well other places. Prices vary widely so look around. Paderno has a set very similar to the Mason Cash, with the flat area on the side. It's in their catalogue, but not online at paderno.com. Call to find out where to get them. They do sell them by the truckload at Paderno Factory Sales held periodically around Halifax. Look there. They would be affordable there (about $39.95 for a set of 3). They come in blue, red and ochre. Take your pick.